Learning to speak Korean, illustrating how car engines work, learning desktop publishing software, and demonstrating how to pilot a plane; these are just a few examples of what students will be learning in my first period class for the next nine Friday's. And that's just the first of seven classes that are exploding with dozens of wildly different projects and ideas. Today we kicked off "Genius Hour" in each of my classes, which includes Graphic Design and Advanced Graphic Design for grades 9-11. Genius Hour is based off Google's 20% time. Google had the theory that if they granted their employees 20% of their time to work on projects they were passionate about that productivity would go up, stress would go down, and Google might just get some cool products out of the deal. Apparently, Google was right. As a result of Google-time, products like Gmail, Google News, Google AdSense, and Google Translate were all brought into existence. It looks like things worked out pretty well for Google. Other companies have adopted similar approaches of giving a dedicated amount of time to their employees to work on project's they're passionate about. Once a month, mobile developer Bottle Rocket hosts "Rocket Science", a 24-hour period where employees gather to create their passion projects. With a solid 24-hour block, it's apparent sleep isn't a high priority for them. "Genius Hour" is the adopted term for this dedicated 20% time, and it's a practice that, in recent years, has been adopted in classrooms around the country. Genius Hour is a dedicated block of time where students can expand their knowledge of new things and create project's they are passionate about. When originally researching Genius Hour, it's easy to see that there can be some confusion, which could lead to mass chaos. To be clear, I generally believe a little bit of chaos is a good thing, but "mass chaos" can get out of control. Genius Hour is not "free time". It's not "nap time". It's not "study hall" or "catch up in other classes time". You Mean There Are Rules? I like to think of them more as "guidelines", but yes, there are a few simple requirements when students pitch their ideas. This must be something the student is PASSIONATE about. RESEARCH is required. - This is kind of a given, since students will be learning something new but it's also worth making a note of. You must SHARE what you learn. - The students will journal, or blog, or vlog about their development for the next 9 weeks. What do they want to do? - This is a brief description of what they are going to learn and/or create. It needs to be something they can complete in nine weeks. WHY do they want to do it? - To me, this is the most important piece. There's needs to be a driving reason behind what they are doing. They must be passionate about it. What are they going to present in nine weeks? - This could be a product, a presentation or a performance. What will success look like for this project? Initially, the 60-second time limit was a point of concern for many students. To put their minds at ease, I modeled a quick presentation before we got started. I began with the first point, "Hello, my name is Mr. T (it's how my students refer to me), and I want to roll out a 'Genius Hour' program in all my classes for the next nine weeks." Then I explained the why, "I've heard that Genius Hour programs have worked well in other schools and produced very positive results and I believe my students are creatively brilliant and should be given the opportunity to explore that creativity by exploring things they want to learn about." Then I wrapped up with what I was going to present in the end. 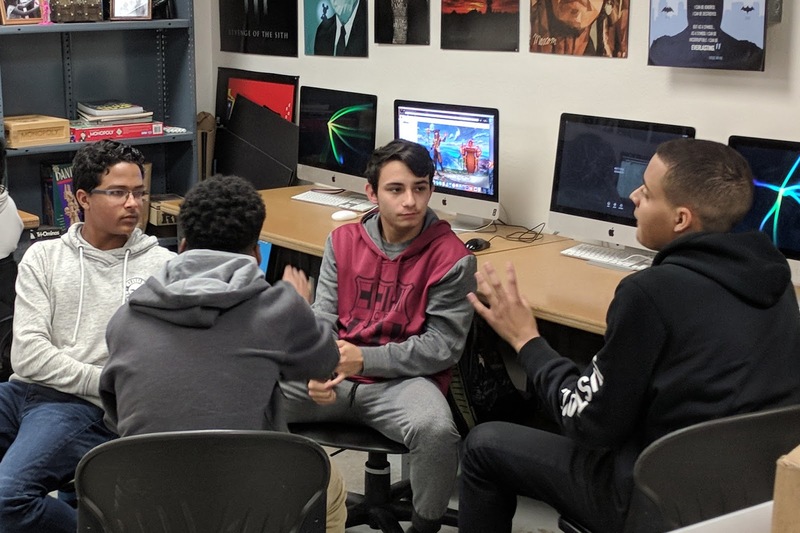 "I'm going to blog about this entire experience so that if other teachers are interested in knowing more about the concept, or want to implement it in their own classrooms, they'll have an idea of what worked, and what didn't in our class." The whole speech took between 35-40 seconds, and showed that I was in this thing with them too. After each student, or group, made their pitch I asked any clarifying questions. I wanted to make sure everyone was learning or creating something new. My default response to each idea was to green light the project. The questions frequently centered around the "why". Sometimes students were pitching projects where the "why" didn't connect with "what" they were presenting. One student said he wanted to expand his skills in Photoshop because he wanted to create videos, but Photoshop isn't used to make videos, so we moved his focus to learning Premier which is a video editing program. There were a number of students that I had doubts about the level of "passion" they had for their project, so I repeatedly asked my favorite question "why?". Judging from their responses, if they could honestly defend their idea and show a true interest in it, I would let them proceed. There were a small number that I marked as "yellow", which meant we needed clarification or approval, or a check on tools an material in regards to production costs. We ended up with 6 or 7 ideas marked as "yellow". They were instructed to get back to me before next Thursday with answers. Only a few of the projects were marked as "red", meaning they were to head back to the drawing board and pitch another idea before next Friday. The other cause for being marked "red" is if a student had nothing to present. "I can't think of anything. ", they'd say. In those rare cases, we would brainstorm a minute or two about possible passions, and what things really interested them hoping for a spark. In the end we had five students marked as red, which means they have until next Friday to come up with an idea. Once all the ideas were presented, students began setting up their documentation method and asked to make their first entry. Some students chose to use their S.H.I.E.L.D. site (online portfolio) for journaling. Others created websites or YouTube channels to document their progress. The Fitness Crew - discussing possible apps and tools they're going to use to record data to track their personal fitness over the course of the next nine weeks. They were so 'into' discussions and journaling that they remained focused up to the last minute of class, and beyond for some. This is my first Genius Hour and I'm very optimistic it will produce some incredible things, hopefully boosting the creative-confidence of many of the students. I know students have been talking about Friday Genius Hour outside of class because teachers and students from other grade levels have asked me about it, or poked their head in class saying they'd heard about it. The question that now hits me is, "Why do we need Genius Hour?" Why is this such a big deal? Only 15%-20% of the projects are requiring technology, hardware or materials provided at the school. In fact, roughly the same amount of projects are going to REQUIRE activity done outside of class. Athletes that are going to film themselves learning a skill, or groups that are going to cook things at home. So basically, they're assigning their own homework. In other words, the vast majority of these projects can be done by the students at any time. But it's like I opened a door to some magical world and said, "Go forth and learn! Expand your mind. Become better." Why do people need permission to learn new things? There must have been 4 students in various classes that all said this exact line, "I got a Ukulele for Christmas several years ago and I've never had the time to learn to play it, so I'm going to learn to play a song on the Ukulele*." * Note to parents: remove Ukulele from Christmas list. That will wrap up our Genius Hour kick off. As I told my students, I'll be blogging about this over the course of the next nine weeks (with a possible 9 week extension after that, depending on how all this goes). Feel free to drop by and see how it's going, but I strongly suggest checking back in nine weeks because believe me, you're going to what to see what develops from all this. If you're brave enough to try this out with me then I've provided the Prezi I used in class to explain the concept below.